“Antique” is a word that is frequently abused, especially in the past twenty or thirty years. It is often paired with the word “collectibles” and its true meaning frequently overlooked. For something to be truly “antique”, it is supposed to be at least one hundred years old. I would venture to guess that in many antique shops today less than five percent of the merchandise comes anywhere close to that – and that’s being generous. 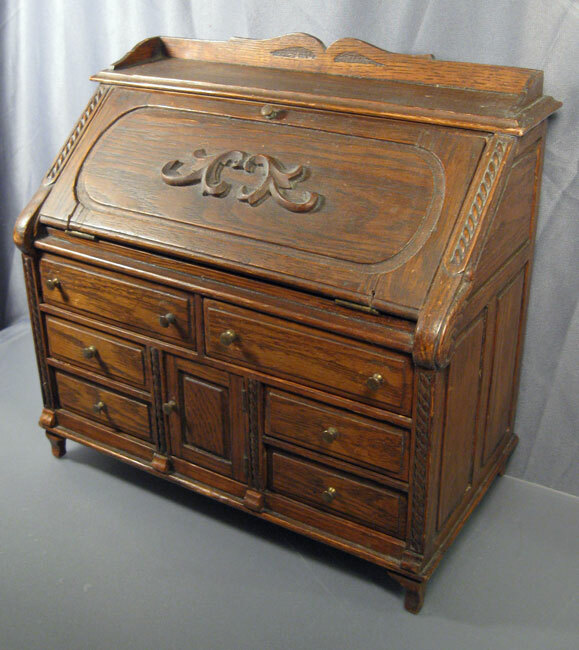 Finding a true antique, especially something that is rare, unique and – best of all – affordable is, therefore, always a thrill. A case in point is the subject of this article – our miniature slant top desk. Measuring just twelve inches wide by twelve inches tall and about six and one half inches deep, this little guy was entirely hand made by someone with a copious amount of patience and skill. The hours spent making it would have been considerable. Carol and I found our little treasure in a Pennsylvania antique shop about two and a half years ago. The shop was housed in an old mill filled with very little else but genuine good quality antique furniture. I found the little desk upstairs lying on top of a table. 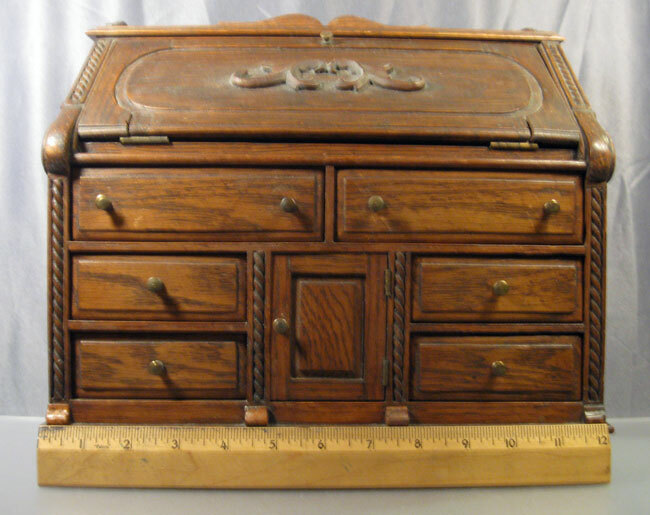 It was in overall good condition but was missing a couple of feet and one of the brass drawer knobs. 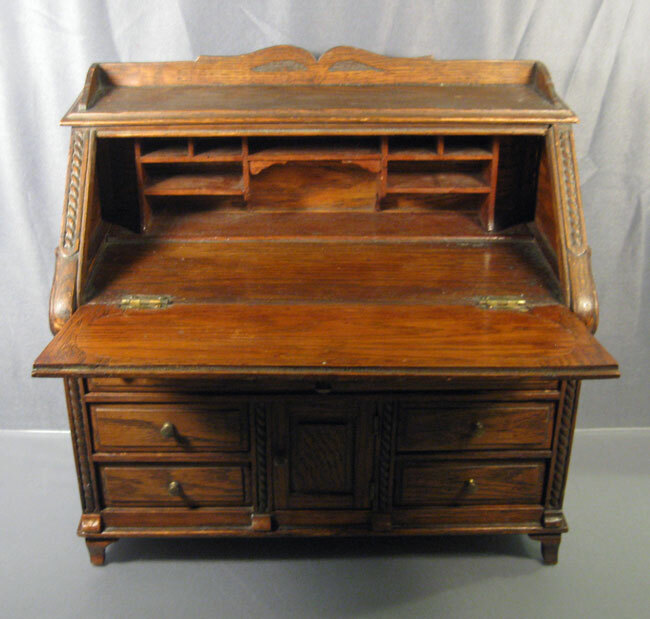 The dealer, who obviously knew a thing or two about furniture, estimated the little desk to be circa 1860 to 1880. No argument there; I thought about 1870. Carol quickly informed me that this was going to be my birthday present in a couple of months, so it soon disappeared from sight. A great present to be sure but not exactly a surprise. Amy was able to make two new feet for it using wood from an old picture frame, and it was finished by the time my birthday rolled around. After searching for about a year and a half, I eventually found a replacement brass knob at a flea market. Now our little desk is complete once again. So why exactly was it made? There is no way of knowing for sure. 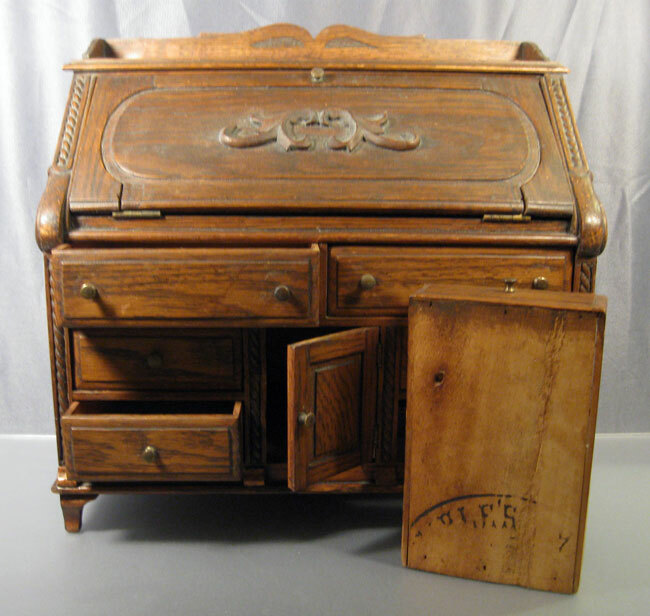 Most miniature pieces of nineteenth century furniture are assumed to be either salesman’s samples or apprentice pieces made by someone learning the furniture trade. It is certainly possible that it is one or both of those. 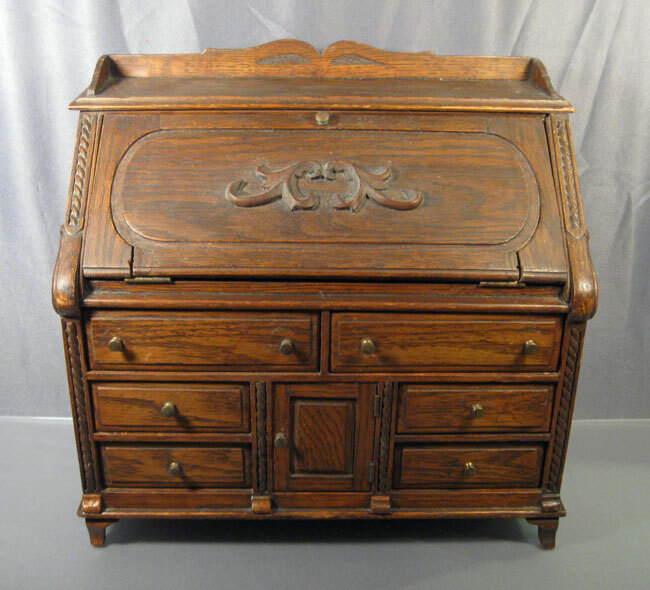 If it is indeed from that 1860 to 1880 period, I suspect it was displayed in a cabinet maker’s shop in a large city such as New York or Philadelphia and used to show all the latest features available to the prospective customer. All the drawers and doors work and there is some indication of the maker on the bottom of the lower drawers – unfortunately not enough to determine exactly who it is. Our little desk created quite a sensation when we showed it to some fellow antique collectors recently. It’s not the sort of thing you see very often or ever have the chance to purchase. We’re just glad we were in the right place at the right time. Shortly after this piece was made, factory-produced furniture at affordable prices would become available to the average American, and local furniture makers would die out. I think this little piece represents the end of their era. Whatever its origins, it embodies the skill and craftsmanship of a bygone time, and it’s awfully cute, too! This entry was posted in 1800's, Americana, Hand Made, Jim, Miniatures. Bookmark the permalink. One Response to Miniature Slant Front Desk – Salesman Sample or Something Else?